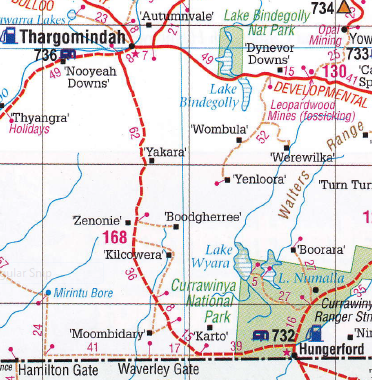 As you are driving through the Outback did you ever think that all that country you are driving through has a name? It has it’s uses, it’s very own history and potential? Some paddocks are quite small, these are holding paddocks or maybe the horse paddock or the one where the killers run. The names come from all over, some are named after people who have lived on the property, some are named after the person who may have done the fencing or who put the tank or bore down in that paddock. Others are named after a particular feature in the paddock and some around here have African names for some strange reason. Some paddocks are better suited to certain types of animals, so they are usually stocked with the same cows or steers year in year out. But then the paddock also needs a spell every now and then so the cows or whatever have to be put into another paddock which suits them just as well. When you put your animals into a new paddock for the first time you have to keep a very good watch over them for quite a while as the first thing they do is go for a walk right around the paddock to check it out. So all the fences have to be in good order. You have to check the corners every few days as sometimes the cows, steers or weaners will sulk and hang in a corner and die there. We also have to make sure the watering points in the paddocks are adequate for the number of stock we put in there. If there are natural waters there in creeks or perhaps dams you have to check them frequently because if they dry up we will probably have to move the cattle back to the man made waters as they may just stay there wondering where the water went. So the water in the troughs needs to be clean and taste sweet or the cattle will head out to a corner and sulk some more. The troughs need to be cleaned frequently too as they can get a build up of yucky stuff in them quite quickly. There you go folks – that is a little about paddocks! How to unload this large truckload of hay??? Hay to be unloaded at the cattleyards. Well, it’s mustering time again and that means buying some hay to feed them as we move them through the yards and into new paddocks. The newly weaned weaners stay in the yard for a week or so and get taken through the yards 3 or 4 times to educate them and get to eat some yummy hay every evening. The cattle that we will be selling also get fed in the yards for a few days until we have enough of them to fill the truck. 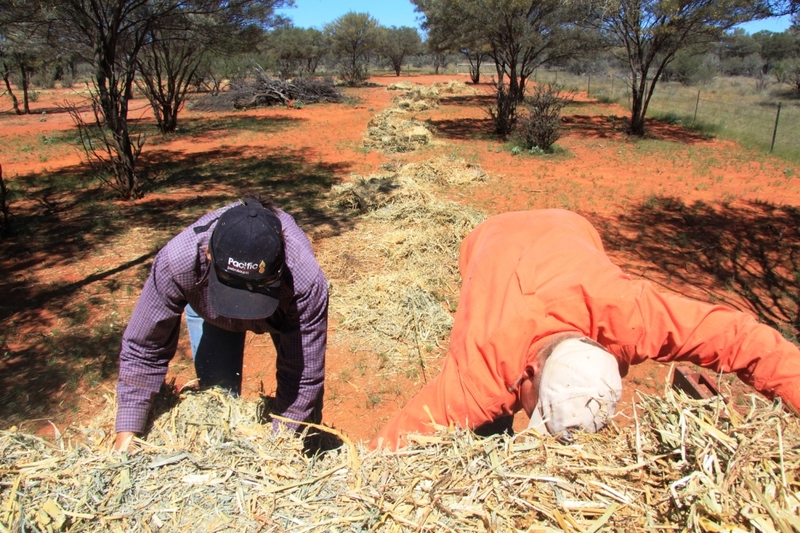 We usually buy our hay from St George which is 600 km away so the freight is super expensive as is the hay. We had a bit of a quandary this time – the trailer was bigger than usual and so there was a third layer of hay stacked up. How to unload it???? The poor old Fordson was not up to the challenge – the hay was just too high and too heavy at 600 kg per bale. 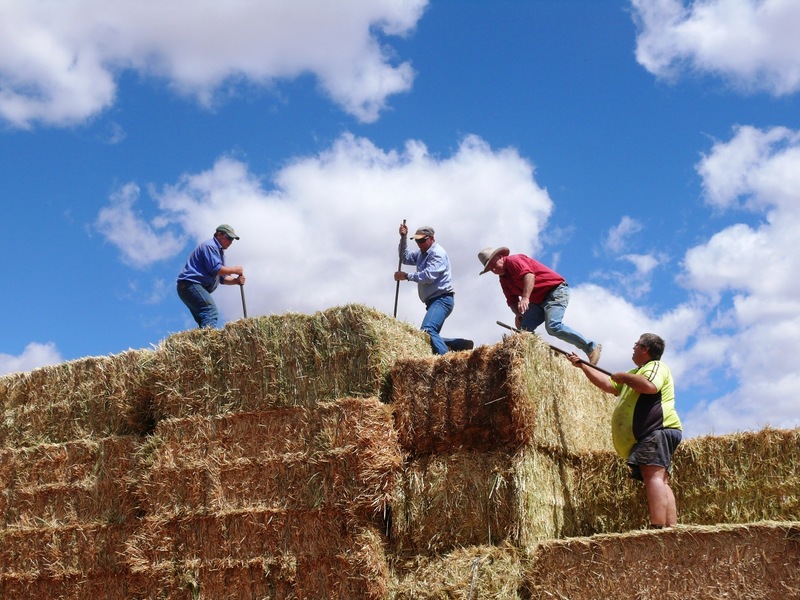 Soo, it was all shoulders to the hay ( except little old me ) J Apparently I’m a bit of a light weight…….. Feeding the hay out for the weaners at Kilcowera Station. …….. Anyway the job took most of the day, rolling the hay off and the using the old tractor to stack it up, then an electric fence around it to keep the passing trade out. The old ” Where does the Outback begin saga”. 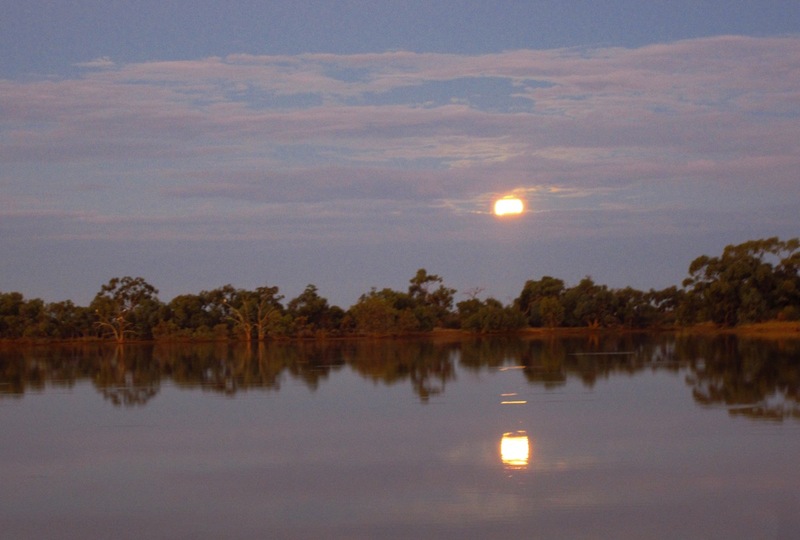 Full moon rising over Cardenyabba Lagoon. This came to me via the Westprint Friday Five, a weekly newsletter that shares all sorts of stuff about life not in the cities. Written by a bloke called Michael in Toowoomba. Thanks Michael, I love your thoughtful description and can really relate to it. Although I’m only half way through my working life, still in my baby cradle as some may call it, I like to talk to people (older and younger) about their travels, domestic and international. I have a friend who is a vet. You don’t know where she will be from one day to the next. It’s nothing for her to buy a plane ticket one day, pack her bags that night and be in another country the next day without too much thought or worry. I would be a nervous wreck and would need months of planning. New Zealand was a huge leap a couple of years ago but now I feel I could just pop over for the weekend without thinking too much about it because I have been there before. If only we didn’t need money of course. Another point is the normal routines we have – example – going to the shops to buy groceries. Some people do it every day and it takes 15 minutes – and that’s the time it takes to get in the car, drive to the shop, get your stuff, drive home and pack the stuff in the fridge. 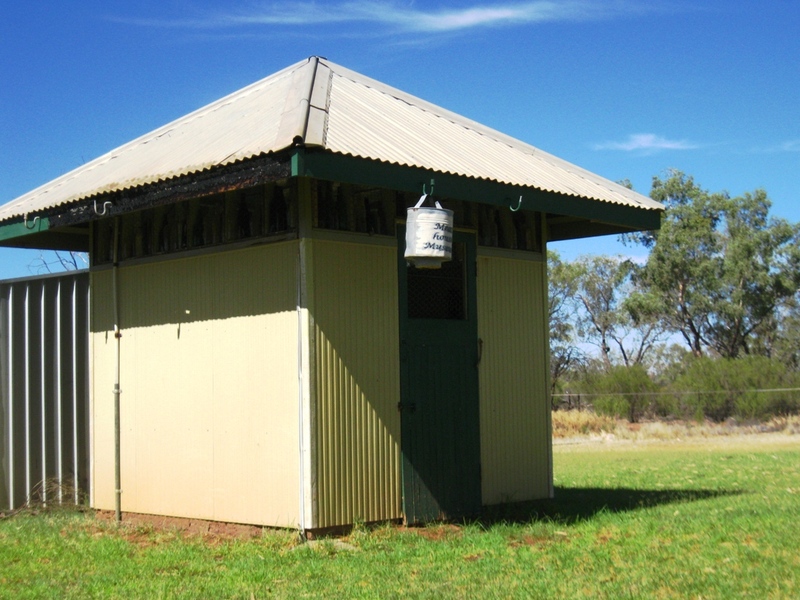 We go about once a week but when I grew up west of Rockhampton; we would go every 6-8 weeks. Yes it’s embarrassing walking out with 5-6 trolleys to feed your large family. 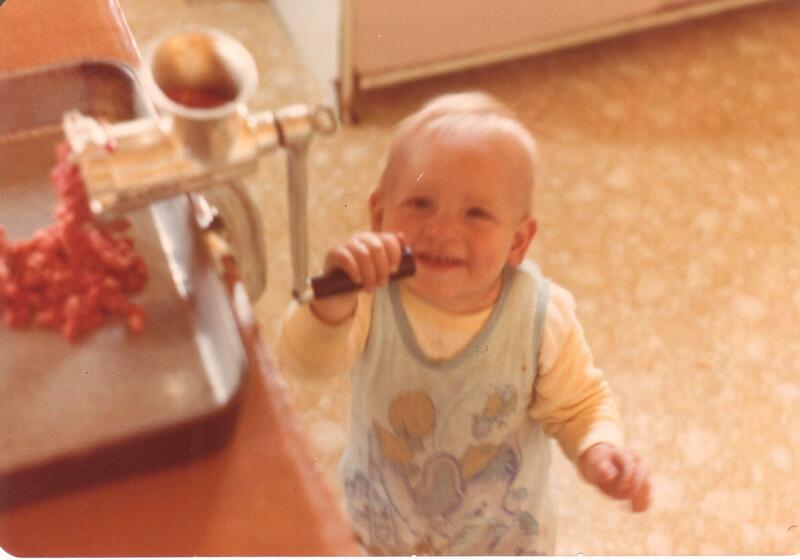 Especially when we had our own meat, milk, vegies and fruit that was grown on the property. What did we put into those trolleys? Spaghetti, baked beans and out of season items. For others it’s a full day event – or even overnight. You drive the 6 hours or more, go to the doctors, pick up the pallet of barbed wire, cattle spray, some new boots, get that hydraulic ram fixed, have a chat to a neighbour because he lives so far away and you haven’t seen them for a while, etc. Then the last thing you do is pick up the groceries,pack the groceries into eskies then travel home at night when it’s cooler so that your items don’t spoil. When you get home at midnight you have to pack those 5 trolleys of groceries away in the cupboard. Too busy tomorrow to have time to pack it away then. So my point? The outback for me is a road that I haven’t travelled, a road that you can drive where you haven’t seen anyone else on the road for a least half an hour. A road where you had to look at the map to find where it starts and where it finishes – even though it could be 500k’s between those points. A road where you need to watch out for critters sleeping on it because the bitumen is nice and warm. It’s the places where you can pull up and have a chat to someone without them wanting to leave in a hurry – because apparently they have something else better to do. A road where you most likely come across a cattle drive and pull up to talk to the rider on the horse. Watch out for those patties – they stink when they a squashed and are usually sloppy because the cattle are excited about the new grass. A road where someone is on a tractor in the paddock and you wave to each other as you fly by – a friendly acknowledgement. He’s probably been on that tractor for a couple of days now and going around in circles is getting a bit boring. A road where it is single lane bitumen and you have to drop off the edge to pass a car with the fear of blowing a tyre on rough bitumen. A road where you have to get right off the road because a 120 tonne road train is coming. Let’s face it – he’s bigger and will fall over if he gets off. That’s a messy sight you don’t want to see. Don’t get me started on gravel roads, corrugations are similar to the rumble strips on the bitumen white lines they keep you awake. Don’t worry, the grader will be through next year after the wet. The ground is just way too hard at the moment. 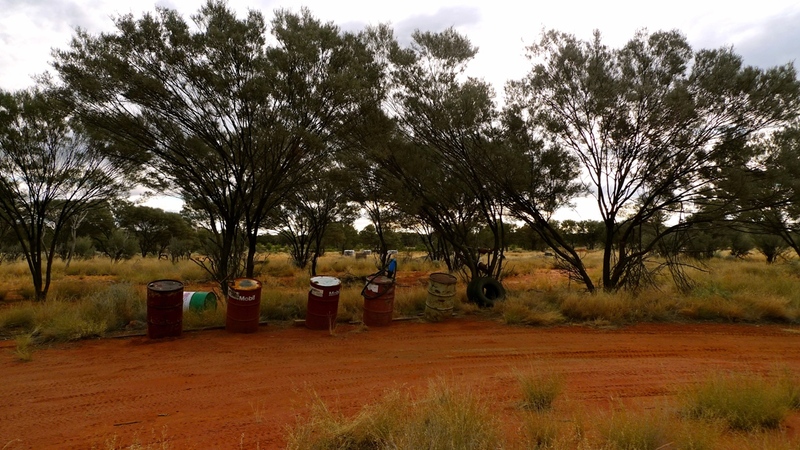 The outback is house driveways that are more than half a kilometre long -the cattle yards and work shed look better then the house. Watch out for all those dogs. The outback is the fenced 50 acres around the house, usually called the house yard and your children get out on Saturday mornings on the two ride-on mowers to mow it. I thought Cape York was remote bit I couldn’t get out of the dust from all the other vehicles flying by. The outback is when you hit a bump so hard you hit the roof and bite your tongue – and your nuts that you were holding (the ones that you eat off trees, shrubs and out of the ground) fly everywhere. It’s amazing the nook and crannies these things get into. The outback is somewhere you can set up your tent, caravan, swag without someone using you tent pegs on the other side of your tent because they are so close. Whispering in the tent next door still sounds like normal talking. Outback is when you realize there are stars in the sky. 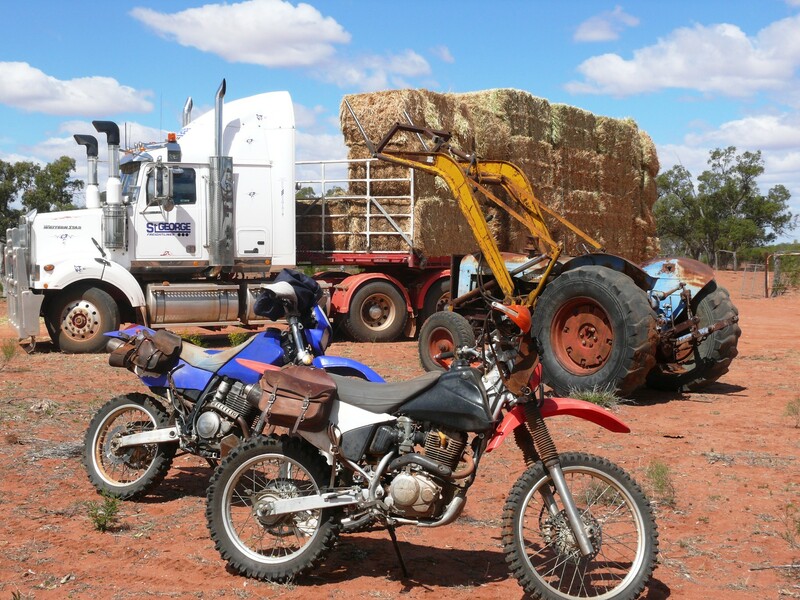 In summary – the outback will depend on someone’s travel experience, where they live, if you need to look at a map to find out where it goes and if you need a full tank of fuel and food to get there. The outback stops becoming the outback when you don’t need a map, you have travelled that road a couple of times and it seems to be another street going through another suburb to get to the shops – even though that shop is 300k’s away. Did I mention that the outback would most likely be a little hotter? So I guess I don’t know where the outback starts or finishes either. I would class the outback as the unknown and untravelled location. Maybe a perception, not a location.